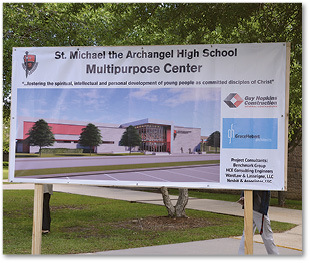 From concerts to choirs and from Masses to mass gatherings, St. Michael the Archangel High School in Baton Rouge will soon have a new building that will play host to such events and more. 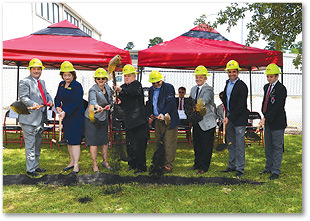 A groundbreaking ceremony for construction of the new 22,000 square-foot multipurpose building was held on Monday, April 23. Plans for the facility have been in the works for four years with fundraisers aimed at getting the $6.4 million dollar project started. Besides providing much needed space for the school, the new building will have state-of-the art equipment for a variety of productions that might include actors, athletes or musicians. There will also be backstage dressing rooms and new lockers. Currently, the school’s lockers are located in a different area than the gym. “This will enhance our physical education and athletics program by allowing students to have that locker room facility right there,” said Lee. Athletic director Rob Smith said he is excited to see the construction begin, and added that this is another way that the school can enhance students’ lives. The school’s gym, built five years after the 34-year-old school was constructed, will continue to host the school’s basketball and volleyball games; however, the multipurpose building, with it’s new sport court floor, will provide extra space during tournaments. The multipurpose building will also double as the band room, allowing the band to practice without disrupting other classes. Construction on the multipurpose facility is expected to take a year to complete.